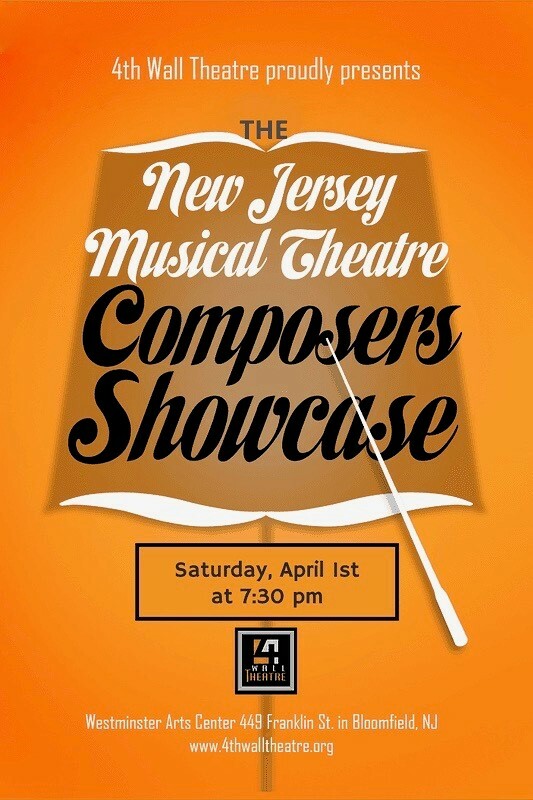 nj arts maven: “NJ MUSICAL THEATRE COMPOSERS SHOWCASE” @ 4TH WALL FOR ONE NIGHT ONLY! “NJ MUSICAL THEATRE COMPOSERS SHOWCASE” @ 4TH WALL FOR ONE NIGHT ONLY! 4th Wall is excited and proud to bring you some of New Jersey's best and brightest new Musical Theatre composers. This concert will feature the new works of Gonzalo Valencia and Michael Campbell, Lawrence Dandridge, David Maglione and Tom Dziuba, Kevin M. Lynch, Wendy Feaver, Max Silverman and Ellington Berg, Clint Edwards and Jon Provan. Their songs, both stand-alone pieces and songs from their complete musicals, will be performed by instrumentalists and singers from all over New Jersey and from the 4th Wall family. Best of all, you will get to hear a couple of new musical "pitches," in which composing teams will present a segment of one of their latest new works-in-progress, and you will get to be among the first audiences to respond with your feedback! PLEASE NOTE: The showcase may include some adult language. Roy Graquitena, Christian Stewart, and Travis Prol.